Is training a dog difficult? The professionals want you to believe it is! That is how they make their money. Everyone who has a little kindness and patience can train a dog to the highest level they choose. Training a puppy is just the same as teaching a young child, the best fastest results are through daily interaction, rather than a "training session" the only difference with puppies is repetition prevention and consistency, The whole family needs to be consistent with what is allowed and what is not, If you allow your small puppy to jump up for a pat he will want to jump up when he is a big dog. So before your puppy arrives home have a family discussion about what is ok and what is not so that all the family are reinforcing the same good habit patterns from day 1.. The True secret to puppy training is Prevention.. Prevent your puppy from making a mistake or unwanted behaviour from the beginning rather than letting him do wrong things then later trying to train him not to do those things anymore. it really is that easy! Tegans Cobberdogs are gobsmackingly smart their ability to learn is astounding and very very quick. Below is a list of basic goals you should plan to achieve with your puppy over the first couple of months. Be settled and quiet in the crate or tether leash while you are busy and have no time to have eyes on! Allow toys and food to be taken, given and taken away again, If he forgets his human manners you need to tell him in dog language it is not good to protect his belongings, 1, push his head down to the floor, use the other hand to hold him firmly on the floor and 2, make growling noises to him hold him till he stops fussing 3, when he is calm gently pet him and hand him his bone or toy , 4, repeat take it away step, and repeat reprimand if needed practice for a few days to be sure he understands he does not need to protect from humans and that his humans are top dog in the family pac. All members young and old can use this training tool under adult support. Stay seated when car stops [Always use a safety car harness. Stay in car when door is open until you give the OK come. Sit , lay down and stand on a table and floor to be groomed. Allow you to hold his beard and turn his head from side to side or stay still. walk on a loose leash on your left side Do not use harnesses they teach dogs to pull, we recommend a check chain or if you prefer a Halter. ​NEVER call your dog/puppy then do something he will not like! this will teach him NOT to come! Follow these simple foundation rules. Consistency: This is your biggest challenges as the whole family need to work as a team and do things in the same way, even in the little things like when to have fun, how to behave at feed time and most important the words you use. Prevention: This is the magic key to training a puppy, whatever is ok now she will believe is permanent, she is the equivalent to a 13 month old toddler so if you are unable to actually have “eyes on her” prevent any mistakes by putting her in her crate with a treat, chew or toy, alternatively you can tie her up to the sofa leg or kitchen table leg with a treat, chew or toy It is important she is not banished to an area on her own, this breed is a people dog so they want to be where ever you are. The crate and tether leash are never a banishment or punishment, they are chill out zones and a nice place to be. If your puppy is in training for support or assistance, Training vest: The reason for having a vest is to teach puppy when and how to behave, For example, at school in class or beside a work station she needs to learn to relax, be patient, come when called, sit when told walk politely at heal etc. The Vest off means she can play, run around have fun and be a normal dog, Over her first 6 to 8 months of training she will associate the enjoyment of working with the vest and equally relax and be a normal dog when it is removed. This breed thrives on brain food meaning they love to learn and will bond to whoever trains her more than anyone else. If there are times she has to spend long periods alone have a radio or tv on for human company. I often have questions from owners as to what to do when their puppy gets scared at the loud noises, or people when they are out with them. Our first instinct is to coddle and tell the dog its okay, just as we would a child. That is the last thing you want to do for your puppy! this actually reinforces the puppy to be scared as they sense your concern for them, What you want to do is “nothing”. This is probably one of the hardest things for many owners to follow. just relax yourself and don`t react, try to avoid any eye contact, do not pick the dog up and cuddle. A calm casual ear massage will help both of you and or offer a very tasty treat. Most important is to think happy calm thoughts your puppy will tune into. Socialise your puppy as much as possible not only the first months of their lives but as they get older. Teenage years and even early adult dogs need socialization to give them a well balanced temperament. Calmness is a state of mind, not a behaviour. Teaching a puppy how to be calm can not be accomplished unless they know how being calm feels. Often owners will tell their puppies to settle down or relax, and the dog will continue the aroused behaviour. Why? Because the dog does not know what being relaxed “feels” like. We teach our puppies the opposite ends of the spectrum. In order for them to understand calm or being “easy” ,they must understand the opposite feeling of being “alert.” Your puppy has received Trust massage since birth so keep it up, it is enjoyable for all of you. Touch is a big part in communication with our dogs. Love, comfort, understanding, reassurance, even pain, all can be conveyed by touch. The skin is the largest sense organ which when touched creates instant release of chemicals such as endorphins, hormones, neurotransmitters, and other substances. Puppies go through several stages during their first eighteen weeks of life. Stress for them ranges from low to high, and changes even on a daily level. They are learning about our world, and sometimes it is extremely simple for them, and other times, fear, confusion, anxiety are feelings they have to learn how to deal with. Their nervous systems have only two modes: fight/fright/freeze and rest and relaxation. In the fight/fright/freeze mode, the body automatically responds by raising the heart rate, raising blood pressure, stress related hormones increase, and the immune system becomes inhibited. 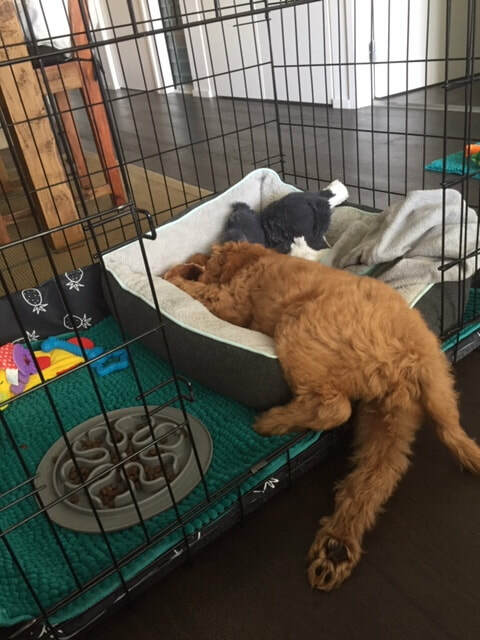 This can happen to a puppy at any level of stress. For example if a puppy becomes stressed because they do not know what is expected of them, it also can manifest itself in a physical way, such as tense muscles, elevated heart rate, even the inability to move. There are some great techniques none are wrong so have a go. ​That is it if you are achieving this within the first 6 weeks of your puppy arriving you have a well mannered family member any training beyond this is for pure pleasure for both you and your dog. The Cobberdog is a working dog they have a brilliant mind and a huge capacity to learn and they thrive on learning so do not restrict yourself due to lack of self confidence teach your dog new things even if it is a simple trick you will have fun and your dog will be a happy propose filled joy to behold.